Ophthalmology (/ˌɒfθælˈmɒlədʒi/, /ˌɒpθælˈmɒlədʒi/ or /ˌɒpθəˈmɒlədʒi/) is a branch of medicine and surgery (both methods are used) that deals with the diagnosis and treatment of eye disorders. An ophthalmologist is a specialist in ophthalmology. Their credentials include a degree in medicine, followed by an additional four years of ophthalmology residency training. They may or may not receive residency training in internal medicine, pediatrics, or general surgery before the ophthalmology residency. Additional training may be sought through a fellowship in a particular specialty of eye pathology. Ophthalmologists are allowed to use medications to treat eye diseases, implement laser therapy, and perform surgery when needed. Ophthalmologists may participate in academic research on the diagnosis and treatment for eye disorders. For a comprehensive list of surgeries performed by ophthalmologists, see eye surgery. Eye surgery, also known as ocular surgery, is surgery performed on the eye or its adnexa by an ophthalmologist. The eye is a fragile organ, and requires extreme care before, during, and after a surgical procedure. An eye surgeon is responsible for selecting the appropriate surgical procedure for the patient, and for taking the necessary safety precautions. Vitreo-retinal surgery, deals with surgical management of retinal and posterior segment diseases. Medical retina and vitreo-retinal surgery sometimes together are called posterior segment subspecialisation. Veterinary specialty training programs in veterinary ophthalmology exist in some countries. The Greek roots of the word ophthalmology are ὀφθαλμός (ophthalmos, “eye”) and -λoγία (-logia, “study, discourse”), i.e., “the study of eyes”. The discipline applies to all animal eyes, whether human or not, since the practice and procedures are quite similar with respect to disease processes, while differences in anatomy or disease prevalence, whether subtle or substantial, may differentiate the two. The pre-Hippocratics largely based their anatomical conceptions of the eye on speculation, rather than empiricism. They recognized the sclera and transparent cornea running flushly as the outer coating of the eye, with an inner layer with pupil, and a fluid at the centre. It was believed, by Alcamaeon (5th century BC) and others, that this fluid was the medium of vision and flowed from the eye to the brain by a tube. Aristotle advanced such ideas with empiricism. He dissected the eyes of animals, and discovering three layers (not two), found that the fluid was of a constant consistency with the lens forming (or congealing) after death, and the surrounding layers were seen to be juxtaposed. He and his contemporaries further put forth the existence of three tubes leading from the eye, not one. One tube from each eye met within the skull. The Greek physician Galen (2nd century AD) remedied some mistakes including the curvature of the cornea and lens, the nature of the optic nerve, and the existence of a posterior chamber. Though this model was a roughly correct modern model of the eye, it contained errors. Still, it was not advanced upon again until after Vesalius. A ciliary body was then discovered and the sclera, retina, choroid, and cornea were seen to meet at the same point. The two chambers were seen to hold the same fluid, as well as the lens being attached to the choroid. Galen continued the notion of a central canal, but he dissected the optic nerve and saw that it was solid. He mistakenly counted seven optical muscles, one too many. He also knew of the tear ducts. The Indian surgeon Sushruta wrote Sushruta Samhita in Sanskrit in about 6th century CE which describes 76 ocular diseases (of these 51 surgical) as well as several ophthalmological surgical instruments and techniques. His description of cataract surgery was compatible with the method of couching. He has been described as one of the first cataract surgeons. Medieval Islamic Arabic and Persian scientists (unlike their classical predecessors) considered it normal to combine theory and practice, including the crafting of precise instruments, and therefore found it natural to combine the study of the eye with the practical application of that knowledge. Hunayn ibn Ishaq, and others beginning with the medieval Arabic period, taught that the crystalline lens is in the exact center of the eye. This idea was propagated until the end of the 1500s. Ibn al-Haytham (Alhazen), in his Book of Optics explained that vision occurs when light bounces on an object and then is directed to one’s eyes. Ibn al-Nafis, an Arabic native of Damascus, wrote a large textbook, The Polished Book on Experimental Ophthalmology, divided into two parts, On the Theory of Ophthalmology and Simple and Compounded Ophthalmic Drugs. translated this around 1150 into the new word “retina”. In the 17th and 18th centuries, hand lenses were used by Malpighi, and microscopes by Leeuwenhoek, preparations for fixing the eye for study by Ruysch, and later the freezing of the eye by Petit. This allowed for detailed study of the eye and an advanced model. Some mistakes persisted, such as: why the pupil changed size (seen to be vessels of the iris filling with blood), the existence of the posterior chamber, and the nature of the retina. Unaware of their functions, Leeuwenhoek noted the existence of photoreceptors, however, they were not properly discovered until Gottfried Reinhold Treviranus in 1834. Georg Joseph Beer (1763–1821) was an Austrian ophthalmologist and leader of the First Viennese School of Medicine. He introduced a flap operation for treatment of cataract (Beer’s operation), as well as popularizing the instrument used to perform the surgery (Beer’s knife). The first ophthalmic surgeon in Great Britain was John Freke, appointed to the position by the Governors of St Bartholomew’s Hospital in 1727. A major breakthrough came with the appointment of Baron de Wenzel (1724–90), a German who became oculist to King George III of England in 1772. His skill at removing cataract legitimized the field. The first dedicated ophthalmic hospital opened in 1805 in London; it is now called Moorfields Eye Hospital. Clinical developments at Moorfields and the founding of the Institute of Ophthalmology (now part of the University College London) by Sir Stewart Duke-Elder established the site as the largest eye hospital in the world and a nexus for ophthalmic research. Numerous ophthalmologists fled Germany after 1933 as the Nazis began to persecute those of Jewish descent. A representative leader was Joseph Igersheimer (1879–1965), best known for his discoveries with arsphenamine for the treatment of syphilis. He fled to Turkey in 1933. As one of eight emigrant directors in the Faculty of Medicine at the University of Istanbul, he built a modern clinic and trained students. In 1939, he went to the United States, becoming a professor at Tufts University. German ophthalmologist, Gerhard Meyer-Schwickerath is widely credited with developing the predecessor of laser coagulation, photocoagulation. In 1946, he conducted the first experiments on light coagulation. In 1949, he performed the first successful treatment of a retinal detachment with a light beam (light coagulation) by with a self-constructed device on the roof of the ophthalmic clinic at the University of Hamburg-Eppendorf. Ophthalmologists are physicians (MD/DO in the US or MBBS in the UK and elsewhere or D.O./DOMS/ DNB, not OD or BOptom) who have completed a college degree, medical school, and residency in ophthalmology. Ophthalmology training equips eye specialists to provide the full spectrum of eye care, including the prescription of glasses and contact lenses, medical treatment, and complex microsurgery. In many countries, ophthalmologists also undergo additional specialized training in one of the many subspecialties. Ophthalmology was the first branch of medicine to offer board certification, now a standard practice among all specialties. In Canada, an ophthalmology residency after medical school is undertaken. The residency lasts a minimum of five years after the MD degree which culminates in fellowship of the Royal College of Surgeons of Canada (FRCSC). Subspecialty training is undertaken by about 30% of fellows (FRCSC) in a variety of fields from anterior segment, cornea, glaucoma, vision rehabilitation, uveitis, oculoplastics, medical and surgical retina, ocular oncology, Ocular pathology, or neuro-ophthalmology. About 35 vacancies open per year for ophthalmology residency training in all of Canada. These numbers fluctuate per year, ranging from 30 to 37 spots. Of these, up to ten spots are at French-speaking universities in Quebec. At the end of the five years, the graduating ophthalmologist must pass the oral and written portions of the Royal College exam in either English or French. In Nepal, to become an ophthalmologist, three years postgraduate study is required after completing MBBS degree. The postgraduate degree in ophthalmology is called MD in Ophthalmology. This degree is currently provided by Tilganga Institute of Ophthalmology, Tilganga, Kathmandu, BPKLCO, Institute of Medicine, TU, Kathmandu, BP Koirala Institute of Health Sciences, Dharan, Kathmandu University, Dhulikhel and National Academy of Medical Science, Kathmandu. Few Nepalese citizen also study this subject in Bangladesh, China, India, Pakistan and other countries. All the graduates have to pass Nepal Medical Council Licensing Exam to become a registered Ophthalmology in Nepal. The concurrent residency training is in the form of a PG student (resident) at a medical college, eye hospital, or institution according to the degree providing university’s rules and regulations. Nepal Ophthalmic Society holds regular conferences and actively promote continuing medical education. In Ireland, the Royal College of Surgeons of Ireland grants Membership (MRCSI (Ophth)) and Fellowship (FRCSI (Ophth)) qualifications in conjunction with the Irish College of Ophthalmologists. Total postgraduate training involves an intern year, a minimum of three years of basic surgical training and a further 4.5 years of higher surgical training. Clinical training takes place within public, Health Service Executive-funded hospitals in Dublin, Sligo, Limerick, Galway, Waterford, and Cork. A minimum of 8.5 years of training is required before eligibility to work in consultant posts. Some trainees take extra time to obtain MSc, MD or PhD degrees and to undertake clinical fellowships in the UK, Australia and the United States. Moreover, a two-and-a-half-year residency program leads to an MCPS while a two-year training of DOMS is also being offered. For candidates in the military, a stringent two-year graded course, with quarterly assessments, is held under Armed Forces Post Graduate Medical Institute in Rawalpindi. The M.S. 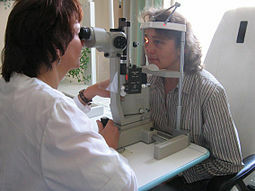 in ophthalmology is also one of the specialty programs. In addition to programs for doctors, various diplomas and degrees for allied eyecare personnel are also being offered to produce competent optometrists, orthoptists, ophthalmic nurses, ophthalmic technologists, and ophthalmic technicians in this field. These programs are being offered notably by the College of Ophthalmology and Allied Vision Sciences in Lahore and the Pakistan Institute of Community Ophthalmology in Peshawar. Subspecialty fellowships are also being offered in the fields of pediatric ophthalmology and vitreoretinal ophthalmology. King Edward Medical University, Al Shifa Trust Eye Hospital Rawalpindi, and Al- Ibrahim Eye Hospital Karachi have also started a degree program in this field. Ophthalmology is a considered a medical specialty that uses medicine and surgery to treat diseases of the eye. There is only one, duly recognized by the PMA and the PCS, professional organization in the country: the Philippine Academy of Ophthalmology (PAO). PAO and the state-standard Philippine Board of Ophthalmology (PBO) regulates ophthalmology residency programs and board certification. To become a general ophthalmologist in the Philippines, a candidate must have completed a Doctor of Medicine degree (MD) or its equivalent (e.g. MBBS), have completed an internship in Medicine, have passed the physician licensure exam, and completed residency training at a hospital accredited by the Philippine Board of Ophthalmology (accrediting arm of PAO). Attainment of board certification in ophthalmology from the PBO is essential in acquiring privileges in most major health institutions. Graduates of residency programs can receive further training in ophthalmology subspecialties, such as neuro-ophthalmology, retina, etc. by completing a fellowship program which varies in length depending on each program’s requirements. In the United Kingdom, three colleges grant postgraduate degrees in ophthalmology. The Royal College of Ophthalmologists (RCOphth) and the Royal College of Surgeons of Edinburgh grant MRCOphth/FRCOphth and MRCSEd/FRCSEd, (although membership is no longer a prerequisite for fellowship), the Royal College of Glasgow grants FRCS. Postgraduate work as a specialist registrar and one of these degrees is required for specialization in eye diseases. Such clinical work is within the NHS, with supplementary private work for some consultants. Only 2.3 ophthalmologists exist per 100,000 population in the UK – fewer pro rata than in any other nation in the European Union. Theodor Leber discovered Leber’s congenital amaurosis, Leber’s hereditary optic neuropathy, Leber’s miliary aneurysm, and Leber’s stellate neuroretinitis. Carl Ferdinand von Arlt (1812–1887), the elder (Austrian), proved that myopia is largely due to an excessive axial length, published influential textbooks on eye disease, and ran annual eye clinics in needy areas long before the concept of volunteer eye camps became popular. His name is still attached to some disease signs, e.g., von Arlt’s line in trachoma. His son Ferdinand Ritter von Arlt, the younger, was also an ophthalmologist. Jacques Daviel (France) claimed to be the ‘father’ of modern cataract surgery in that he performed extracapsular extraction instead of needling the cataract or pushing it back into the vitreous. He is said to have carried out the technique on 206 patients in 1752–53, of which 182 were reported to be successful. These figures are not very credible, given the total lack of both anaesthesia and aseptic technique at that time. Joseph Forlenze (1757–1833) (Italy), specialist in cataract surgery, became popular during the First French Empire, healing, among many, personalities such as the minister Jean-Étienne-Marie Portalis and the poet Ponce Denis Lebrun. He was nominated by Napoleon “chirurgien oculiste of the lycees, the civil hospices and all the charitable institutions of the departments of the Empire”. He was known also for his free interventions, mainly in favour of poor people. Albrecht von Graefe (1828–1870) (Germany) Along with Helmholtz and Donders, one of the ‘founding fathers’ of ophthalmology as a specialty. He was a brilliant clinician and charismatic teacher who had an international influence on the development of ophthalmology, and was a pioneer in mapping visual field defects and diagnosis and treatment of glaucoma. He introduced a cataract extraction technique that remained the standard for over 100 years, and many other important surgical techniques such as iridectomy. He rationalised the use of many ophthalmically important drugs, including mydriatics and miotics. He also was the founder of one of the earliest ophthalmic societies (German Ophthalmological Society, 1857) and one of the earliest ophthalmic journals (Graefe’s Archives of Ophthalmology). He was probably the most important ophthalmologist of the 19th century. Allvar Gullstrand (Sweden) was a Nobel Prize-winner in 1911 for his research on the eye as a light-refracting apparatus. He described the ‘schematic eye’, a mathematical model of the human eye based on his measurements known as the ‘optical constants’ of the eye. His measurements are still used today. Julius Hirschberg (Germany) in 1879 became the first to use an electromagnet to remove metallic foreign bodies from the eye and in 1886 developed the Hirschberg test for measuring strabismus. Socrate Polara (1800–1860, Italy) founded the first dedicated ophthalmology clinic in Sicily in 1829, entirely as a philanthropic endeavor; later he was appointed as the first director of the ophthalmology department at the Grand Hospital of Palermo, Sicily, in 1831 after the Sicilian government became convinced of the importance of state support for the specialization. Vladimir Petrovich Filatov (1875–1956) (Ukraine) contributed the tube flap grafting method, corneal transplantation, and preservation of grafts from cadaver eyes and tissue therapy. He founded thFyodoe Filatov Institute of Eye Diseases and Tissue Therapy, Odessa, one of the leading eye-care institutes in the world. Shinobu Ishihara (1879-1963) (Japan), in 1918, invented to Ishihara Color Vision Test, a common method for determining Color blindness. He also made major contributions to the study of Trachoma and Myopia. Ernst Fuchs (1851-1930) was an Austrian ophthalmologist known for his discovery and description of numerous ocular diseases and abnormalities including Fuchs’ dystrophy and Fuchs heterochromic iridocyclitis. Tsutomu Sato (Japan) Pioneer in incisional refractive surgery, including techniques for astigmatism and the invention of radial keratotomy for myopia. Jules Gonin (1870–1935) (Switzerland) was the “father of retinal detachment surgery”. Sir Harold Ridley (United Kingdom), in 1949, may have been the first to successfully implant an artificial intraocular lens after observing that plastic fragments in the eyes of wartime pilots were well tolerated. He fought for decades against strong reactionary opinions to have the concept accepted as feasible and useful. Charles Schepens (Belgium) was the “father of modern retinal surgery” and developer of the Schepens indirect binocular ophthalmoscope whilst at Moorfields Eye Hospital. He was the founder of the Schepens Eye Research Institute, associated with Harvard Medical School and the Massachusetts Eye and Ear Infirmary, in Boston, Massachusetts. Marshall M. Parks was the “father of pediatric ophthalmology”. José Ignacio Barraquer (1916–1998) (Spain) was the “father of modern refractive surgery”. In the 1960s, he developed lamellar techniques, including keratomileusis and keratophakia, as well as the first microkeratome and corneal microlathe. Svyatoslav Fyodorov (Russia) was the “father of ophthalmic microsurgery”. He improved and popularized radial keratotomy, invented a surgical cure for cataract, and developed scleroplasty. ^ “ophthalmology”. Oxford Dictionary. Retrieved 14 September 2015. ^ “ophthalmology”. Dictionary.com Unabridged. Random House. ^ a b c d “History of Ophthalmology”. www.mrcophth.com. ^ Boyd, Kierstan. “Ophthalmology Subspecialists”. AAO. ^ Smith, Yolanda (5 September 2016). “Ophthalmology”. News-Medical.net. ^ AAO (1 November 2013). “What is an Ophthalmologist?”. American Academy of Ophthalmology. ^ WebMD. “What Causes Eye Problems?”. WebMD. ^ Smith, Yolanda. “Subspecialties of Ophthalmology”. News Medical Life Sciences. ^ “Acvo.com”. Acvo.com. Retrieved 2012-05-27. ^ “Ecvo.org”. Ecvo.org. Retrieved 2012-05-27. ^ “ophthalmology”. Online Etymology Dictionary. ^ Boslaugh, Sarah (2007). Encyclopedia of epidemiology. SAGE. p. 547. ISBN 978-1412928168. ^ Bidyadhar, N.K. (1939), Sushruta’s Ophthalmic Operations, Archives of Ophthalmology, 22, page 553. ^ Agarwal, R.K. (1965), Ancient Indian Ophthalmology, The Ophthalmic Optician, 5(21),1093-1100 (the title of this journal was changed to Optometry Today in 1985), published by the Association of Optometrists, London, England. ^ “Susruta: The Great Surgeon of Yore”. Infinityfoundation.com. Retrieved 2008-11-04. ^ Kansupada, K. B.; Sassani, J. W. (1997). “Sushruta: The father of Indian surgery and ophthalmology”. Documenta ophthalmologica. Advances in ophthalmology. 93 (1–2): 159–167. doi:10.1007/BF02569056. PMID 9476614. ^ David C. Lindberg (1980). Science in the Middle Ages. University of Chicago Press. p. 21. ISBN 0-226-48233-2. ^ a b Leffler CT, Hadi TM, Udupa A, Schwartz SG, Schwartz D (2016). “A medieval fallacy: the crystalline lens in the center of the eye”. Clinical Ophthalmology. 2016 (10): 649–662. ^ David C. Lindberg (1997). Helaine Selin (ed.). Encyclopaedia of the History of Science, Technology, and Medicine in Non-Western Cultures. Kluwer Academic Publishers. p. 410. ISBN 0792340663. ^ de Jong, Paulus T. V. M. (10 August 2014). “From where does “rete” in retina originate?”. Graefe’s Archive for Clinical and Experimental Ophthalmology. 252 (10): 1525–1527. doi:10.1007/s00417-014-2769-1. ^ “Important Dates in Vision Science”. www.arts.rpi.edu. ^ Fuchs, Ernst, and Alexander Duane.Text-book of Ophthalmology. Philadelphia, PA: J.B. Lippincott Company, 1908. Books.google.com. 2001-01-01. Retrieved 2013-03-11. ^ Wyman A.L. (1991). “Baron De Wenzel, Oculist to King George III: His Impact on British Ophthalmologists”. Medical History. 35 (1): 78–88. doi:10.1017/s0025727300053138. PMC 1036270. PMID 2008123. ^ Davidson Luke (1996). “‘Identities Ascertained’: British Ophthalmology in the First Half of the Nineteenth Century”. Social History of Medicine. 9 (3): 313–333. doi:10.1093/shm/9.3.313. ^ Namal Arin, Reisman Arnold (2007). “Joseph Igersheimer (1879–1965): A Visionary Ophthalmologist and his Contributions before and after Exile”. Journal of Medical Biography. 15 (4): 227–234. doi:10.1258/j.jmb.2007.06-63. ^ Goes, Frank (2013). Eye in history. New Delhi: Jaypee Brothers. ISBN 9789350902745. OCLC 813930522. ^ Boyd, Benjamin (2010). Modern ophthalmology : the highlights : the account of a master wintnessing a 60 year epoch of evolution and progress (1950-2010). Panama: Jaypee-Highlights Medical Publishers. ISBN 9789962678168. OCLC 720191230. ^ Wincewicz Andrzej; et al. (2009). “Dr Adam Zamenhof (1888-1940) and his insight into ophthalmology”. Journal of Medical Biography. 17 (1): 18–22. doi:10.1258/jmb.2008.008037. PMID 19190194. ^ “College of Physicians and Surgeons Pakistan”. Cpsp.edu.pk. Retrieved 2012-05-27. ^ “King Edward Medical University”. Kemu.edu.pk. Retrieved 2012-05-27. ^ “Pao.org.ph”. Pao.org.ph. Retrieved 2012-05-27. ^ “PBO Officers ”. Pao.org.ph. 2012-12-01. Retrieved 2013-03-11. ^ “European Union of medical specialists”. Uems.net. Retrieved 2013-03-11. ^ Parisi, Antonino (1838). Annuario Storico del Regno della Due Sicilie, dal Principio del Governo, di Ferdinando II Borbone. Tipografica Trani (Napoli). pp. 66–67. ^ Müller, Andreas (1 June 2003). “Professor Ernst Fuchs (1851-1930)”. Archives of Ophthalmology. 121 (6): 888. doi:10.1001/archopht.121.6.888.